These muffins are quick and healthy. Oats, bananas, greek yogurt then sweetened with honey! A great breakfast for those busy mornings! I had a bunch of bananas that were just begging me to make them into something delicious. I asked my Instagram followers for suggestions. And then I needed more bananas cause I wanted to try all the recipes! Story of my life. So many recipes, never enough time (or bananas in this case). This is one of the recipes I whipped up. It was super easy and made in a blender which I love. Oh and did I mention healthy? My kids gobbled these up. My daughter actually tried to eat the tops off all the muffins (because I put mini chocolate chips on top) so I had to put a stop to that! Next time I think I will mix in the chocolate chips so she won’t try to do that again. These muffins can easily be gluten free as long as you use gluten free oats. The oats replace the flour and give them a nice texture. And my favorite part is they are made in the blender. Easy, healthy and they taste great! Preheat your oven to 375 degrees. Prepare your mini muffin pan or regular muffin pan with cooking spray or cupcake liners. Blend oats in a blender or food processor. When they are a flour consistency add the rest of the ingredients and blend them all together. If adding chocolate chips, you can stir them into the batter or just sprinkle some on top. Bake for 13-15 minutes. This recipe makes about 18 muffins or 36 mini muffins. Recipe Source: my friend Courtney / The Beauty Mark. I used my Blendtec blender to make these and I just have to say how much I love my blender! I use it almost everyday. A must in any kitchen and well worth the investment. I have an (affiliate) link below if you want to check it out. 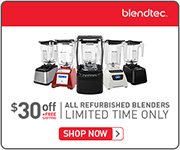 A refurbished blender (with a 7 year warranty!) is only 279.99! I highly recommend them. I ran across your blog name on Pinterest tonight, and just had to say hi to a fellow Arizona blogger. As I read your About page I was amazed at the things we have in common. I think the only way that we are different is that I don’t snow board! 🙂 It is nice to meet you, and I look forward to getting your posts in my e-mail. I also enjoy muffins and these look delicious! I love that you make them in the blender. I am so glad you said hello! Fun to meet another Arizona blogger 🙂 I am excited to check out your blog as well! So fun that we have so much in common. Hope you enjoy the muffins!